Nature delivered Thursday on the winter storm warning in effect through this evening, dumping flake after flake from sunup to sundown. The early-season storm allowed Sun Valley Resort to open more runs on the Warm Springs side of Bald Mountain. Those include Upper Warm Springs, Warm Springs Face, Mid Warm Springs, International, Mid Limelight, Upper Picabo and Challenger Liftline. Resort spokesman Jack Sibbach said the No. 5 Lookout Express lift on the River Run side is planned to start Saturday. Dollar Mountain opens for the weekend starting today, but will close Sunday and reopen for continuous daily operation starting Friday, Dec. 10. Even though the winter storm warning ends this afternoon, the National Weather Service predicts a chance of snow every day for the next five days. To see the most up-to-date information concerning open lifts and ski runs, visit the resort's website, www.sunvalley.com, and go to the "Mountain" tab. Though he did not provide skier counts for the Thanksgiving season opener, Sibbach said the resort did a little more business than it did in 2009, when it also opened on the holiday. In 2009, Sibbach reported 2,471 people hitting the slopes for Thanksgiving, an improvement over opening days of the past three years. He said the turnout in 2005 was about the same. The 2008 opener occurred two weeks after Thanksgiving because of low snowpack. Other Idaho ski mountains are also reporting healthy snowpacks. Brundage Mountain reported yesterday that it will open Saturday, its earliest opening in three years. The resort near McCall reported that 21 inches of snow had fallen there this week. Grand Targhee in Wyoming, just over the border from Driggs, Idaho, was reporting a 50-inch base on Thursday. Schweitzer Mountain in northern Idaho was reporting a 62-inch base at the top of the mountain, with the resort scheduled to open today. Alaska Airlines and Horizon Air have launched a Hot Deals on Ice winter sale, discounting one-way fares between Seattle and Sun Valley to $75 on select days from January to March because of the resort's 75th season. Tickets must be bought by Monday, Dec. 6. Fares already cost $99 available throughout the winter on Horizon Air daily nonstop flights from either Seattle or Los Angeles to Sun Valley. Passengers flying to Sun Valley on Horizon from Seattle also receive the additional benefit of a free half-day of skiing at Sun Valley Resort on the day of arrival. 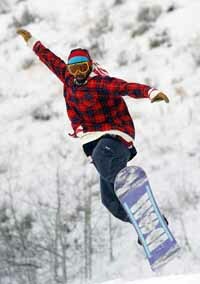 Passengers from Los Angeles receive a free demo ski or snowboard package the day following their arrival. Details can be found at www.sunvalley.com/horizon.